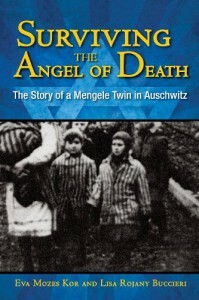 Surviving the Angel of Death: The Story of a Mengele Twin in Auschwitz - Jess Loves to Read! I first heard of Eva Mozes Kor when I saw her answers on Quora, discussing her experience in the concentration camps and her advice about forgiveness. When I saw that this book was available through NetGalley, I was excited to read it. I knew a little bit of Eva's story from reading her answers on Quora, but this book went much more in depth in describing her life before and after the war, as well as her experience with Dr. Mengele. I loved this book! Eva is a remarkable woman who had a horrible thing happen to her and used that experience to try to teach others the power of forgiveness. She founded a group that reconnected the twins that survived Dr. Mengele's experiments, and she now runs a holocaust museum. I would recommend this book to absolutely anyone!